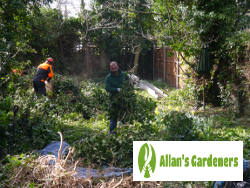 Allan's Gardeners is a premium gardening services company which operates across London for over 10 years. With thousands of satisfied customers and a wide array of gardening services to choose from, we are the go-to choice for your garden maintenance needs. Through the years, we've worked hard on improving every aspect of the services we provide, from booking to training of the gardening teams to conducting the service and providing quality work at affordable prices. Why Choose Allan's Gardeners for the Maintenance and Design of your Garden in London? When you need assistance outside, whether it's for a one-off improvement, tree care work, any type of pruning and weed removal, garden maintenance and weeding, we have the right service for you. Make your selection from amongst our most popular services. Remember - when you combine multiple options into your ideal package you can end up making big savings! Garden Maintenance - is our catch-all service for one off or regular support around your garden. You set the priorities, and your expert London gardeners follow them. Garden Design - when you need to level land, install a new bit of decking or patio, to lay turf or astroturf, or any other designing and landscaping task, this is the service to choose. Gutter Cleaning - we use the Gutter Vac Clearance System for all gutter cleaning. The system uses a carbon fibre extension pole and mounted camera for safety. Let us clean your gutters so leaves and other particles do not clutter your gutters and speed up the process of rusting and rotting. Patio Cleaning - using high-tech jet washing equipment, we achieve impeccable results on even long-neglected patio spaces, driveways, pathways, and other surfaces! Tree Surgery - like all of our other services, highly trained professionals deliver our tree surgery option. Perfect for trees up to 65 feet high. Lawn Care - ideal for both regular hassle-free mowing, and for grassy areas that struggle to show good growth, or that have become worn down or tired. 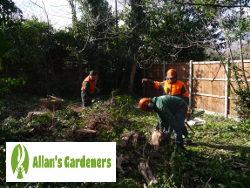 All of the tools and equipment used by Allan's London gardeners and the qualified tree surgeons use are top of the line. For tree surgery, for example, the gardening team uses the latest safety harnesses and equipment, latest models chainsaws, and other. Your gardeners will come equipped with all of the tools they'll need for a particular task, while the specialists who perform gutter cleaning and patio cleaning services will be armed with the latest Gutter Vac systems and high-pressure washers. By doing any of these you make it easy for us to give you a preliminary quote on what you want to get done. We'll then confirm this for you on-site before work starts. This will be either as you tell the garden maintenance team what you want done this time, or after we survey the site for garden design work. There's no obligation to you. You'll find our lines are open 24/7 - so don't delay, call today and enjoy the immaculate gardening services by Allan's Gardeners!